You might think that finding healthy filling snacks on the go is hard, but it’s really not! Finding healthy snacks that fill you up is easier than ever nowadays. There are so many different kinds—pumpkin, sunflower, sesame, poppy, chia, you name it! Bonus? Seeds are full of protein! Just grab yourself a baggie full and munch while you work! You don’t have to do the old stovetop method anymore--you can take a microwavable packet into work and have a healthy, simple and delicious meal! Don’t forget to sprinkle some cinnamon on it! Other fruits work too. Add whatever you want to make the ultimate oatmeal treat! Craving something sweet? Dried fruit is a healthy choice with lots of fiber. Simple and delicious! When your sweet tooth kicks in, remember to gravitate towards fruit! There’s apples, bananas, apricots, berries, cantaloupe, coconut, kiwi, lemons, mango, nectarines, peaches, papaya, pineapple, and so much more! Chock-full of minerals and vitamins, this dish is easy to prepare and perfect for a quick lunch break. You can never go wrong with yogurt. Add fruits like blueberries for an extra kick. You can also buy one where the fruits are already in the yogurt—an even quicker healthy snack! 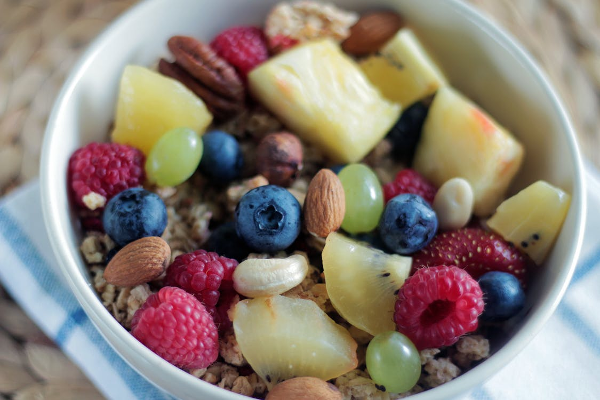 Make sure that you add granola! Add some blueberries and/or raspberries, or maybe even peaches. Sounds unconventional, but we swear you’ll love it! Many people don’t think they don’t like cottage cheese, but it has such great health benefits! Full of fiber and protein and perfect for a quick lunch break. Super convenient and can fit in a purse or briefcase that you can carry to work. Not only are they full of healthy fats, they are actually good for your mind too! They have been proven to lower your stress levels. Win-win! Who doesn’t need to alleviate some stress in their life? Nut butter is a spread made from crushed nuts like almond, cashew, macadamia, pecan, pistachio, and walnut. It’s like peanut butter, but healthier and with less added sugar. Get some fruit or some crackers and dig in! Here us out: it’s quick, it’s tasty, and it’s convenient. Just make sure to buy the low-sodium version! That way you can fully appreciate the protein that the jerky provides without feeling guilty for the extra salt! These are just some of the many options you can choose from to have a convenient, healthy meal. We know you’re busy, but you can still manage to make smart, healthy choices! For those who crave these healthy foods listed here and but don’t have the time to incorporate them into their lives, consider a professional catering service. Whether it’s for preparing nutritious individual meals or catering for a group with a delicious and healthy meal, look into your local options to find a solution that makes wholesome eating a breeze.